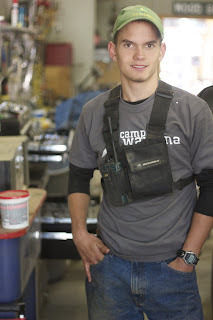 The year around season began with Camp Wawona missing a maintenance assistant. The CW Team spent each morning in prayer asking for God to send someone to fill the position and it wasn't long before Douglas arrived. Hailing from Wisconsin, Schappert's presence was noticed over night as many more things began to be accomplished. The CW Team is thankful that God answered their prayers by sending Douglas to help in the year round ministry. and he already sports the wawona radio bra. nice work guys.